The Chicago Bears and Minnesota Vikings were both 2-0 as they faced off in Minneapolis on September 19, 1985. The Bears, coached by Mike Ditka, were well-established as a tough defensive club. Defensive Coordinator Buddy Ryan’s aggressive unit had led the NFL in total defense and set a record with 72 sacks in 1984. 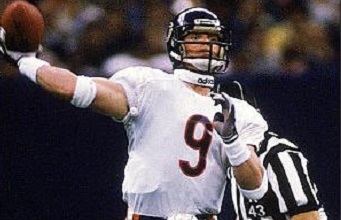 Colorful QB Jim McMahon (pictured above) was a tough and effective leader of the offense – when he was able to play. Injuries were a nagging problem, and back and neck injuries suffered in the previous week’s game put him in traction during the week and made him unlikely to face the Vikings; his backup, Steve Fuller, would start in his place. The Vikings were coming off a dreadful 3-13 season under Head Coach Les Steckel, necessitating the return of his predecessor, the highly-esteemed Bud Grant, to right the ship. After missing 20 games due to injury over the course of the previous two years, QB Tommy Kramer was back and healthy and he had an exciting new target to pass to in WR Anthony Carter, a refugee from the USFL. There were 61,242 fans in attendance for the Thursday night game at the Hubert H. Humphrey Metrodome. The Bears got the first break when CB Leslie Frazier intercepted a pass by Kramer to give Chicago the ball at the Minnesota 37. 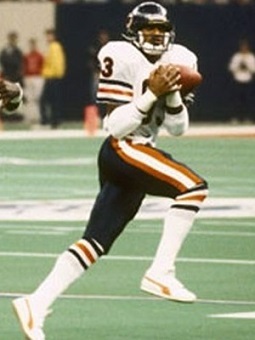 Steve Fuller completed two 12-yard passes to WR Willie Gault but, after having first-and-goal at the eight, the Bears had to settle for a 24-yard field goal by Kevin Butler. The Vikings responded with a 10-play drive that covered 61 yards. They converted two third downs, on Kramer passes to WR Mike Jones for 13 yards in a third-and-four situation and to Jones again for 12 yards while facing third-and-six at the Chicago 29. Jan Stenerud kicked a 25-yard field goal and the score was 3-3 after a quarter of play. The teams traded punts in the second quarter until the Bears advanced to the Minnesota 16. However, Fuller was sacked by DE Mark Mullaney for a loss of seven yards and a pass into the end zone was picked off by CB Carl Lee. Chicago got the ball back four plays later when punter Greg Coleman dropped the snap and CB Shaun Gayle recovered at the Minnesota 22. Five carries by star RB Walter Payton gained 20 yards but the Bears were unable to penetrate the goal line and Butler kicked another field goal, this time from 19 yards. Minnesota regained possession with 3:15 remaining in the half. Kramer threw to Anthony Carter for 16 yards to get the ball into Chicago territory and completions to TE Mike Mularkey and Carter picked up another 31 yards. Two plays later, Kramer connected with Carter in the corner of the end zone for a 14-yard TD and, with Stenerud’s extra point, the Vikings took a 10-6 lead into halftime. The Bears started off the third quarter with Fuller throwing to Gault for a 21-yard gain on the way to a 34-yard Butler field goal that narrowed Minnesota’s margin to 10-9. However, the Vikings turned around and went 66 yards in 10 plays. In a third-and-nine situation at his own 45, Kramer threw to WR Buster Rhymes for a 33-yard gain and the series ended with Kramer completing a nine-yard touchdown pass to Mike Jones. Down by 17-9, and with 7:32 remaining in the third quarter, Jim McMahon came off the bench to relieve Fuller. It didn’t take him long to make his presence felt. On his first play, McMahon went long to WR Willie Gault for a 70-yard touchdown that, with the successful extra point tacked on, narrowed Minnesota’s margin to 17-16. Five plays into the Vikings’ next possession, Chicago LB Wilbur Marshall intercepted a Kramer pass. It set up another McMahon scoring pass, this time to WR Dennis McKinnon for 25 yards. In just two plays, McMahon had completed two passes for 95 yards and two scores. McMahon and the Bears still weren’t done with third quarter scoring. Following a punt by the Vikings, and with 33 seconds remaining in the period, McMahon completed a six-play, 68-yard drive by connecting with McKinnon again for a 43-yard TD. McMahon had tossed three touchdown passes in a little more than seven minutes of action and the third quarter ended with Chicago in the lead by 30-17. The reeling Vikings encountered more problems when their next series reached the Chicago 30 after Kramer completed a pass to Rhymes for 36 yards. They could move no further and a field goal try was aborted when the snap sailed over the holder’s head. The Bears gained possession at the Minnesota 44 and advanced to the 17 before Butler missed on a 34-yard field goal try. Kramer threw to TE Steve Jordan for a 23-yard gain and two plays after that the Vikings got back on the board as Kramer connected with Carter for a 57-yard touchdown. There was still 9:19 remaining in the contest and it was a six-point game. McMahon wasted no time in moving the Bears down the field. On the first play following the ensuing kickoff, he went deep to McKinnon for a 46-yard gain to the Minnesota 34. From there they moved to the 18 before Butler booted a 31-yard field goal. Minnesota’s next series lasted just two plays as Kramer completed a short toss to Jordan, but the tight end fumbled it away. The Bears came up empty when Butler was wide on a 45-yard field goal attempt, but there were less than two minutes remaining and time ran out on the Vikings. Chicago won by a score of 33-24. The Bears outgained Minnesota (480 yards to 445) but the Vikings had the edge in first downs (23 to 21). Minnesota had difficulty running the ball, gaining just 34 yards on the ground in 15 carries. Kramer was also sacked four times and the Vikings turned the ball over on five occasions, to just one suffered by Chicago. In less than a half of action, Jim McMahon completed 8 of 15 passes for 236 yards and three touchdowns with none intercepted. Steve Fuller was 13 of 18 for 124 yards with no TDs and one picked off. Willie Gault (pictured at right) had a huge performance with 6 catches for 146 yards and a touchdown and Dennis McKinnon was right behind with four receptions for 133 yards and two TDs. Walter Payton, hindered by bruised ribs, rushed for 62 yards on 15 carries and added 5 catches for 17 yards. For the Vikings, Tommy Kramer went to the air 55 times with 28 completions for 436 yards and three touchdowns, but also tossed three interceptions. Anthony Carter caught four of those passes for 102 yards and two scores, Steve Jordan contributed 5 catches for 66 yards, and Buster Rhymes gained 89 yards on three receptions. RB Darrin Nelson led the miniscule ground game with 18 yards on 5 attempts. “I didn’t plan to use Jim before the game, but he said he knew what was going on and said ‘you can use me if you need me’,” explained Mike Ditka of the decision to send McMahon into the game in the third quarter. The Bears went on to post a 15-1 record on the way to winning a NFL title. The defense remained the dominant factor in the club’s success, and Jim McMahon missed a total of three games, but when healthy he completed 56.9 percent of his passes for 2392 yards and 15 touchdowns against 12 interceptions. Willie Gault caught 33 passes for 704 yards (21.3 avg.) and Dennis McKinnon had 31 receptions for 555 yards (17.9 avg.) and seven touchdowns. Walter Payton, still great in his 11th season at age 31, rushed for 1551 yards. Minnesota recovered to win at Buffalo the following week but lost three of its next four games on the way to a 7-9 tally and third place in the NFC Central. Tommy Kramer passed for 3522 yards and 19 TDs, but also a league-leading 26 interceptions. Anthony Carter had a fine first year in the NFL with 43 catches for 821 yards (19.1 avg.) and eight touchdowns and Steve Jordan led the club with 68 pass receptions.